Kowhaiwhai (scroll design): Inspired by: Ngaru, a traditional Maori design representing the cutting of the waves as the ‘waka’ moves through them; the famous koru (fern frond) motif which Air New. Wellington to Auckland in 8 hours and 42 minutes: When I was at the Silver Stream Train Museum I was told, 8 hours and 42 minutes is still the record time for that particular route! 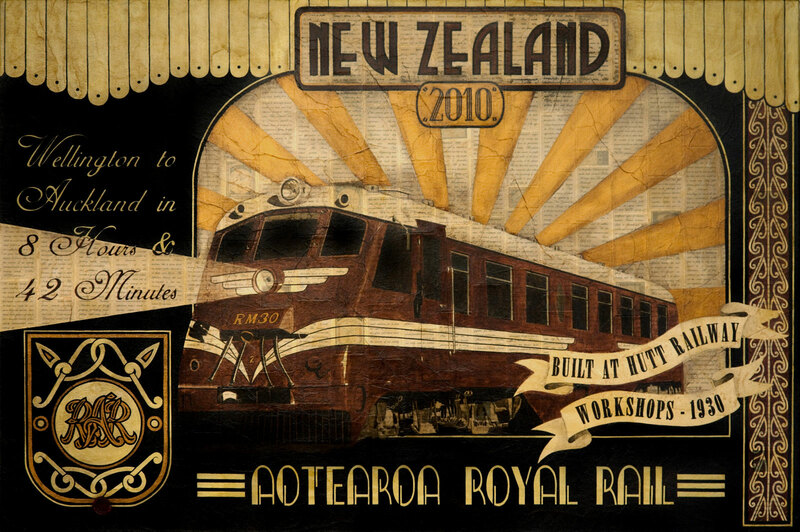 Aotearoa Royal Rail (logo): I have incorporated a design I saw on an old New Zealand Rail bench seat into my logo. I used the word royal due to the many connections to NZR which had crowns in them. Roof: Last time I was at the Otaki railway station I took some photos. The roof trim along the top of the painting is based on them.